Joanie said that it should be a post about a keepsake. In other words, an experience that causes me to remember something. And which tells something about me. I have m-a-n-y memories. However, most of them tell too much about me. One memory that comes easily to mind is a visit to the Isle of Capri a few years ago. That was the holiday where I was chasing George all over Italy having a break from the long Scottish winter. My memories should have only been of a classy and beautiful holiday destination. Of an island of myths, charming seafarers, ancient Roman orgies, dreamy sea views, 1950s celebrities in big sunglasses, and lazy summer evenings spent browsing in exclusive boutiques alongside the world's elite. Right? Well kind of. Except when I think of the Isle of Capri now I think of dangling over cliff tops in a chairlift wishing I could loosen my grip on the bars long enough to reach out and push my friend into the water below. I have no remorse for such thoughts. She wouldn’t have felt a thing. She was delirious with laughter!! And all at my expense. Now I should explain at the outset that my friend and I are polar opposites in almost every way. How different we are became apparent on our trip to Capri. The island is gorgeous. It’s a given. It abounds in olive groves, cliffs, hills, and garden terraces overlooking the blue water of the Mediterranean. However, there is something mythical yet at the same time equally disturbing about the place. We arrived in Capri town by boat, then took a bus up a cliff top road with numerous hairpins to get to Anacapri. A picturesque whitewashed village with souvenir shops, pedestrian lanes and designer shops. 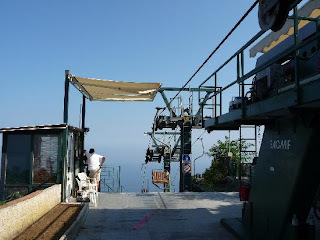 After we had walked through the town, my friend asked if I wanted to take the chairlift up to Capri's highest point, Monte Solar (589m above sea level). My look said it all. Like she even had to ask. She smiled and said, "well just come over with me and wait until I get back". So we walked to the chairlift area. And so I stood to wait for her right near where the guy in the picture is standing. I was deep in thought, minding my own business when all of a sudden I could hear the noise of the chair lift coming right behind me. Before I could even turn around, a guy came hurtling towards me, pushed me sideways back into a chair and off I went. Up the mountain. Strapped in with some flimsy piece of plastic. I was in shock. And then I screamed. Did I tell you I am terrified of heights? Even standing up makes me giddy! The chairs were all swaying in the strong wind and all I could hear was my friend in the chair behind screaming with laughter. My legs started swinging and one of my shoes fell off into some poor unsuspecting Italian's vegetable patch. How did I know when I dressed that morning that I'd be flying through the air like some disturbed circus act? So I let the other one go too. Imagine Guiseppe's surprise when he was picking his tomatoes the next day only to find that a couple of size 8 mules had sprouted in his prized patch. I couldn't look down, up or sideways. All I could think of was that I didn't want to die in southern Italy because they bury their dead on top of each other on cliff tops. That would be my idea of Hell. By the time I finally reached the top of the summit, I had to be almost surgically removed from the chair because my hands were so tightly clenched to the rail. There was apparently not only a picturesque cafe and terraces but panoramic views as well. Who knew? I still don't know. I missed it. I refused to open my eyes long enough to take a good look. I flopped down on a cafe chair and ordered the strongest drink they had. Unfortunately that was an espresso. I threw it back like a shot. Have you ever tasted real Italian coffee? I followed it up with three more. Let's just say it did nothing but accelerate the nerves, jitters and rapid heartbeat. There I was was, shoeless, desperate and accompanied by a red faced, cackling clown. Thankfully, a nice American tourist, who just loved Australian accents (even high pitched hysterical ones), took pity on me and gave me a swig or ten of his medicinal spirits. Hell, I was hoping he would piggy back me down the mountain on foot but his inconsiderate wife was having none of it. The only thing that got me down that mountain again, if truth be told, was the thought of a new pair of shoes from one of those little boutiques in Capri town. And the trip back down was way better than going up. My mind was fully occupied - hatching a devious plan to get my friend back. And so I did. What laughs we shared. Did I tell you how much I love Italy and all things Italian (besides chairlifts)? I really, really do. So, go on, what does that memory say about me? I am all ears. Ciao! And go check out the lovely Joanie at her blog Joanie's Random Ramblings. She is so funny and spirited. She gave me a Keeper's Award for which I am honoured. I am giving it to any of my readers who want to share their keepsakes too. Absolutely hilarious. LOL When are you going to write that book ? it says you are willing to do anything for a new pair of shoes woman! LOL funny story reminds me of me and my friends sooo opposite yet so much fun. I loved this story. I too have a fear of heights I don't do ladders well at all. could be because I have trouble just walking without making a spectacle of myself by falling and doing flips in the process...yes very talented when I fall..I have learned to do it well without breaking something..cuz I do it all the damn time! Ugich - because I ran into Guiseppe in Edinburgh!! He he!!!! Dear Lilly ... all I can say is we must be sisters separated from each other in childhood AND by many years! I am terrified, terrified of heights too. I won't ride a ferris wheel, but can be coaxed onto a roller coaster ~ the premise being the ride will be over before it begins AND if I close my eyes I'll never know I rode it. The huge wheel turning in the sky, slowly, is something else entirely. Once, a handsome and very persuasive fellow who I loved madly talked me into a hot air balloon ride over the Colorado Rockies. I will never forget the pilot telling me (after we had been airborne five or more minutes) that I could open my eyes and let go of my death grip on the rope. I knew it would be my one and only journey into space. Your story is, of course, hysterically written (i.e. funny.) AND thank you for the message of support. It means more than you know. I am still laughing too hard to submit a proper comment. So, this will have to do for now, and since I have no expectations of recovering control anytime soon, don't look for much later. Sorry. Ohhh, I want to know how you got your friend back - now THAT would tell us even more about you. Hehe. You are too funny! Love this story. Ya had to go and mention George, didn't ya??? Oh Lilly, I feel your pain. That chair lift is about the very last thing I would have ever done too! I hate heights and I'm not all that fond of friends who tell me to "get over it" and set me up on crazy adventures like you took. All I can say is the farmer should be glad it was just your shoes he found in his garden. I'm afraid, if it was me, he'd have found the contents of my stomach! Oy! Great post as always. I admit I did laugh too :-) And the pictures are wonderful! 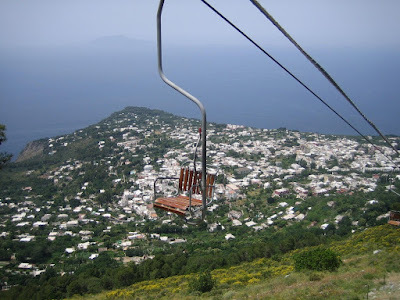 I'm adding Capri (minus the chair lift) to my list of places to see. My Goodness! I would have been scared too if it had been so sudden!! What was that guy thinking of?! And, your friend really has a wicked sense of humor! How did you get back at her?! I am still chuckling as I type! What it says about you is that you are a very forgiving spirit if you still called her "friend!" Oh, just the visual "dangling" in my head!! I've loved the idea of the Island of Capri for so long, but it never occurred to me about the cliffs and height of it! And are you going to detail your devious revenge plot for us now? I just know that was equally as good!! I was holding my breath while laughing. You may want to see about getting your shoes back, that is, if they haven't built a shrine around it. That was too funny!! Brought back fond memories of when I bounced up and down on a suspension bridge that my Mum and her friend (both scared of heights) were on. I received a "no champagne for you" penalty. Must admit, it was worth it for the looks on their faces! I am with you all the way. I know that i should be more daring but heck I hear about people falling to their death all the time. So unless I'm drunk, you won't see me any higher then the curb. Now..."Capri" how romantic, you should write a book ....and soon! Hmm..let's see...you really love to shop? //if the prospect of buyin gnew shoes helped you that much! you are also forgiving as your freind reamins your friend...and you choose to look at the brighter side of life. Love the stroy though. Hilarious. Gosh, needed that today. Thank you. You are such a talented writer. hello lilly, from another lillie! i just came to your blog via the shop bug and enjoyed this keepsake post. lovely! That was so funny as you always are. Now let me make some observations about what this says about you. 1. You have a great snse of humor and dont tke yourself too seriously because you can laugh at yourself. 2. You do not wear practical footwear when flying through the sky like a trapeze artist. 3. You do however like shoe shopping, especially in Italy. 4. You still have a thing for George. 5. You love Italy but hate heights. 6. You have great friends because if she hadnt done that then we wouldn't have got the great laugh we did. 7. You dont want to be buried on a cliff face. Delightful post as always, had me chuckling as it reminded me of trip I took in Austria. I'm not really afraid of heights, but those wiggly chairs would spook anyone! OMG Lily, all I can picture in my mind is you slinging back espresso's like they were tequila. You mad thing you. I bet the Italians didn't know what hit them. Too funny! I am liking the new banner! Hey Christine, no it did me good, I eventually summoned up the courage to go in a hot air balloon ride with man other people mind you so it made me face my fears. I am not sure that I would go on that chair lift again though simply because the safety aspects of it scared me a little. I feel the pain of your memory while laughing like a hyena.. I too am terrified of heights! OK... Lily, I'm now on the edge of MY seat. I need to know the "rest of the story" as Paul Harvey used to say. This is so hilarious except that I was terrified for you. OK Kay I will add the rest of the story to my post lidt. It was a fun trip all around! Oh Lord, those chairs looked positively petrifying - I'm not surprised you were apprehensive/scared witless about them! Jeez. Thankfully, a nice American tourist, who just loved Australian accents (even high pitched hysterical ones), took pity on me and gave me a swig or ten of his medicinal spirits. Hell, I was hoping he would piggy back me down the mountain on foot but his inconsiderate wife was having none of it. Bad bad wife,... how could she not let her husband 'assists' a gorgeous blond Australian woman in distress? Bad bad wife! Hahaha,... I can just imagine the woman's face! Ah, much as I enjoyed your story, I would first like to visit Paris! As soon as I make big money and don't have to travel just for work,.. Thank you Lilly, as always, a great read. Ahhh, Italia . . . Funny stuff! You are a talented story teller! how have you been? we spent a month with my family and it has been great... your memory reminds of when I rode this ride at Brunei's park. It was a chair that soars up and up and up until you can see the entire city before it releases you in full speed. I'm terribly afraid of heights too but i was crazy to give it a try, hehehe.... when it was going up, i wanted to change my mind but it was too late.... my knees were weak when it was over. but looking back now, i'm glad i did it and got to tried it at least. But i don't think I'll give it a second shot. You know that lost shoe could make for a great story. Along the lines of the custom inspector story. Oh Lilly! I'm with you on the heights thing! I'd have had a heart attack! I can't even go on high fast amusement park rides. Hey! Thanks for the link to my blog! Wonderful - this is so similar to my own Capri story - but different!! I was lucky enough to go to Capri with my parents and while my Mum and I thoroughally enjoy the rickety chair lift ride up my Dad was in a total anxiety state about the height and kept fretting that he'd loose his shoes!! Your photos are so lovely too - so glad I met you Lilly - your blog is amazing!! You're such a good writer! It says you are a remarkable story teller and funny as hell! What a GREAT STORY! I loved it...and I must confess...I was laughing at your horror a tiny bit myself. Just don't push me off anything! And a new pair of Italian shoes will fix most of what ails ya! @ Nikkicrumpet - yes there are a few things in life that make life more berable, shoes being one of them! First thanks for coming by to take a stroll through my pics...I am delighted and hope you will come back frequently. Next, I am Italian/Albanian...so as your post suggests you should simply love me. The last thing is that your memory made me think that often some of my most wonderful moments have been ones that I was forced to undertake.. So now I am working on making life run a bit more smoothly by not resisting so much and giving in and living more. I am not a fan of heights either. Chair lifts really scare me going back down. That is the worst. I adore Capri...one of my favorite places in the world, and I must admit, if one has to lose one's shoes, couldn't find a better place to lose them than in Italy! Now I must roll my giggling self back to work! Thanks for making me smile today! Its a long way to the top if you want to rock and roll - what a laugh with you of course, not at you. Hhahhahah well played Lilly! After a long hiatus my blog is back up and running now that I'm no longer a homeless writer! Starting up my job as a writer in Taipei next week, now I have a house to live in and plenty of time to document my ridiculous excuse for a life in The Way It Is. Stay down at sea level from now on huh! Woot Woot shes back must go see!!! Great post - wonderfully written! Lily- I am so afraid of heights, too!! I would have DIED!!! Shoes or no shoes! Great post!!! I was right there with you! I always tell people, God made me this short because I get dizzy any taller! I would have died and been buried in Italy. Sarah, hello new grandmother, funny comment! Thanks for dropping by. The island looks and sounds like a nice vacation spot. I enlarged the lift chair, boy, you would not get me on that thing for a million dollars, well, maybe 2 million, ha, ha, ha. I can see why you screamed and too be pushed into it like that, maybe your shoe hit the person, oh my. I hope you found a nice pair of shoes. This definitely will be a memory you won't forget. Thank you for coming by, hope your weekend is going great. You must be very careful how you pick your friends Lilly....I have never been on a chairlift, but I did get stuck at the top of a ferris wheel at a fairground...for around an hour, whilst they got the damn thing going again....never....never again. Thanks for a lovely witty story. Wonderful post and memory (I would have freaked out for sure!). The photos are amazing. Hope you're having a lovely break now. Yikes, a Ferris Wheel...Henry that sounds like hell to me too.